When Patrick Robinson was signed by the Philadelphia Eagles early last spring, few could have predicted just how valuable his presence would end up being to the eventual Super Bowl Champions. Robinson finished his first season in Philadelphia with a coverage grade of 89.6, a mark that was the highest among all players in the NFL who spent at least 70 percent of their coverage snaps in the slot. 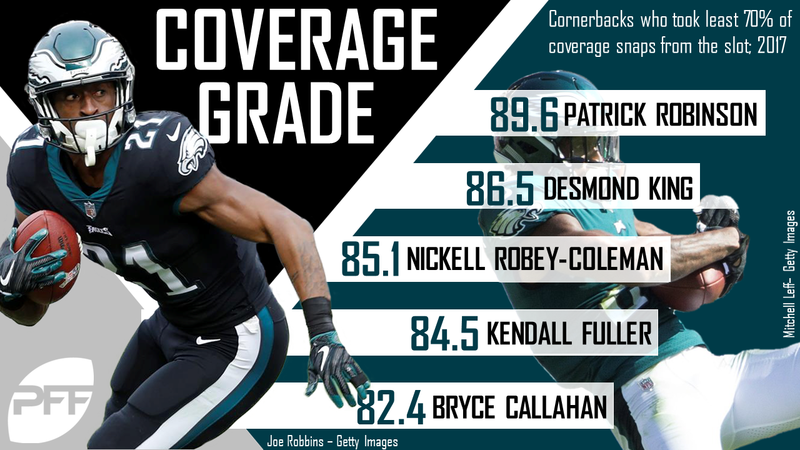 Robinson’s coverage grade in 2017 was just below the threshold to be considered Elite and he was the highest-graded member of the Philadelphia secondary. When Robinson hit the free agent market in March, his high-level play was rewarded with a four-year deal that will take him back to New Orleans, where he began his career. With the departure of Robinson, the Eagles are now tasked with finding a suitable replacement as the 2018 season approaches. The Eagles will hold an open competition for the open spot on the starting roster, but it is likely that one of the following five players will begin the season as the starting slot cornerback. While Maddox has yet to play a snap in the NFL, his listed height and weight of 5-foot-9 and 184 pounds, are prototypical of an effective NFL slot cornerback. To build on this, a look at Maddox’s combine numbers will show you that he is one of the quickest cornerbacks in the 2018 draft class, recording a 4.39-second 40-yard dash and a 4.00-second 20-yard shuffle. Throughout his four years at Pittsburgh, Maddox played 43 coverage snaps from the slot, but a successful transition to the inside position could be the rookie’s ticket to more playing time. The first player who could (and maybe should) be given an opportunity to shine is 2017 second-round pick in Jones. He was regarded as being a top-tier cornerback in the draft until he suffered an Achilles injury that dropped his draft position. 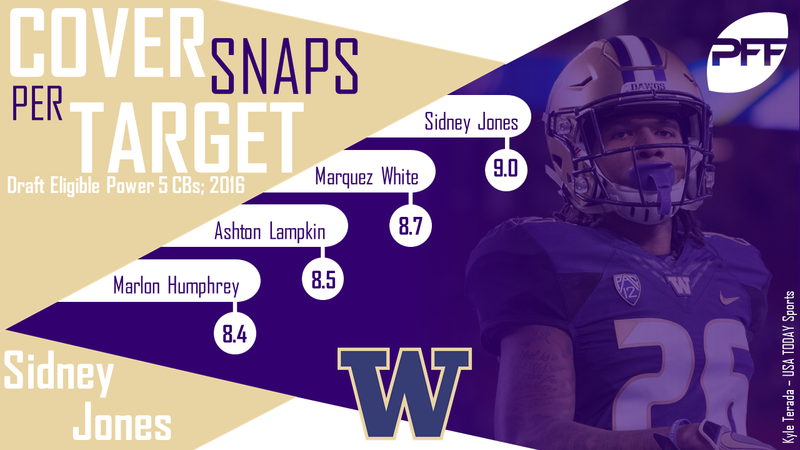 Due to this injury, Jones was forced to miss a large portion of his rookie season but if you take a look back to his final year in Washington, you will find that Jones was a shutdown cornerback. Jones allowed a reception every 18.7 snaps that he spent in coverage, the eighth-best figure among the 2017 NFL Draft class at cornerback. He blanketed his receivers in coverage, as he was only tested once every 9.0 snaps in coverage, the best figure in among Power-5 cornerbacks in the draft class. While Jones did not get much playing time from the slot in college, his elite coverage ability and quick feet could translate nicely to allow him to be a dependable slot cornerback in the NFL. In his final year with at West Virginia, Douglas’ eight interceptions were tied for the most among all NCAA FBS cornerbacks. Despite being buried on the depth chart, Douglas was able to show the same ball-hawking skills he was known for at WVU throughout his rookie season. 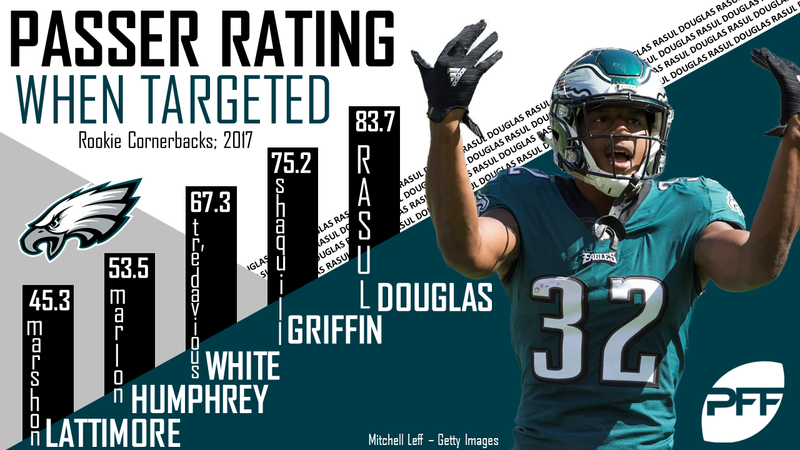 When compared to his fellow first-year cornerbacks, Douglas allowed the fifth-lowest passer rating when targeted. Like Jones, Douglas did not spend many of his collegiate snaps from the slot, but his ability to slow down opposing quarterbacks will play well in any spot throughout the secondary. Mills, after looking very underwhelming his rookie season, looked every bit an NFL cornerback in his second year. 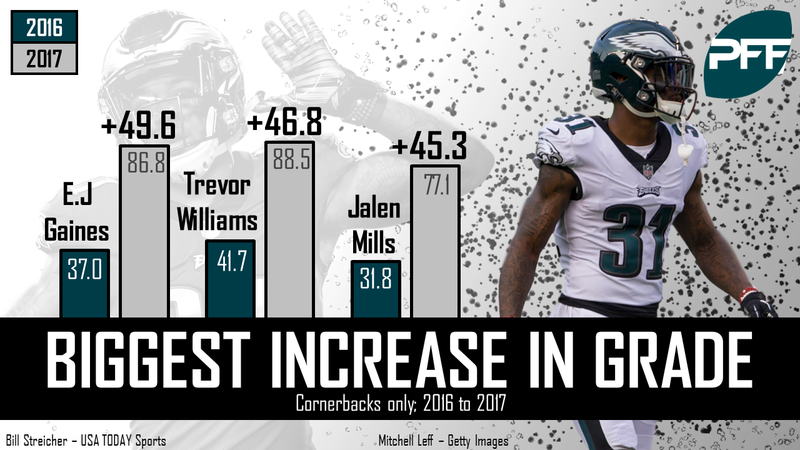 When compared to other cornerbacks on a PFF grade standpoint, Mills was the third-most improved player from 2016 to 2017. While Mills is considered to be a very quick, aggressive cornerback, his long-distance speed is not up to par when compared to other cornerbacks around the league. A move to the inside where quickness is required could be very beneficial transition for the third-year cornerback. The final scenario that could play out would be for Philadelphia to move the veteran Jenkins to a full-time cornerback position. In 2017, Jenkins played 422 snaps from the linebacker position and 323 from the slot but only 268 from the safety position. Because of the way Jenkins has been used, a switch to slot cornerback may not be as extreme as it sounds. With training camp set to start in just two weeks, the Eagles don’t have much time to decide how they will proceed, but it is a safe bet that one of the aforementioned players will be playing a majority of their snaps from the slot this season. One thing is for sure, either way they go, they should have a bevy of talent in their secondary, despite the loss of Robinson, it’ll just be a matter of how they utilize their defensive backfield in their Super Bowl defense.